Staying healthy is more than just exercising. It’s also about eating right. Most gym-goers will tell you that, without the right dietry habits, you will not witness the desired results. That’s why many fitness enthusiasts subscribe to programs like Fitness Muscle Meals and get nutritional bodybuilding meals delivered straight to their door. That can be pretty hard when you’re just starting your health journey. After all, we’re bombarded by processed food and sugar at every turn. Even the healthiest person will sometimes fall prey to unhealthy food cravings. So what can you do to stick to healthier eating choices? While almost every diet plan out there will urge you to count calories, if you’re just starting off, try not to pressure yourself too much. You’ve probably seen the phrase “based on a 2,000-calorie diet.” The truth is the FDA chose this number because it was as close as they could get to the average amount most people need to maintain their weight. The truth is, your ideal intake is based on your age, gender, ethnicity and physical activity levels. Also realize that when you eat fewer calories, it can leave you feeling hungry throughout the day. This often leads to snacking on junk food because that’s what we naturally reach for when our body is wanting calories. The point is, cutting calories only leads to frustration and discouragement. That’s why so many people drop their meal plan or dietary goals in a few months. Remove the temptation to reach for a bag of chips at home by getting rid of them altogether. Instead, replace it with something else that can curb your salty or crunchy craving. Want something sweet? Reach for some fruit instead of cookies. Or if you’re a soda lover, add fresh fruit to seltzer water or give kombucha a try. But don’t try to completely overhaul your diet all at once. The best way to stick to your nutrition plan is to phase processed foods out slowly. If you try to take on too much at once, it will get overwhelming and there’s a higher chance you will fall back onto your old eating habits. Knowing exactly what you replace your processed foods with can also be confusing and intimidating. The general rule of thumb is to make your diet include as many whole foods as possible (e.g., brown rice, sweet potatoes with the skin, carrots, or cabbage). Simply put, avoid food with long ingredient lists or foods that are made in factories. But why are whole foods better than processed foods? Whole foods make a HUGE difference. In fact, nutrition experts have even created massive books on the subject because they’re such an important part of a healthy diet (if you’re interested in the topic, I highly recommend this book on whole foods). Whole foods also provide a plethora of vitamins, minerals, and proteins essential to your diet. When food is processed, it’s stripped of these nutrients. Whole foods are also rich in fiber. As a result, your body must work harder to break the food down. This helps you feel full longer and stabilizes your blood sugar levels. Processed foods, on the other hand, get quickly digested by your body and cause your blood sugar levels to spike. You then get hungry more quickly (this is why so many people eat too many calories) and experience an energy crash due to the blood sugar spike. The best way to stick to your nutrition plan? Of course, not everyone has the time to spend on making a home-cooked meal every day. With the right tools, though, it is possible to have something healthy on hand. For example, a slow cooker is a great option for people who have no time to cook after work. Cooking in bulk is another big time saver. In other words, cook a few meals ahead of time on a day off and store them in the freezer or fridge. That way you’ll have plenty of options for the whole week, and all you need to do is reheat them. If you don’t want to eat the same food for the whole week, consider partial bulk cooking. For example, cook a lot of chicken for the week and then use it in different recipes such as chicken noodle soup, chicken salad, etc. If you know what meals your making, you can even cut all your veggies and herbs ahead of time. Just store them in mason jars or glass Pyrex containers. The more you plan ahead, the easier it will be to eat healthily. You can even cook while you travel. Rather than stay at a hotel, consider renting out an Airbnb. This way you have access to a kitchen. Thanks to the internet coupled with a Virtual Private Network, you can also access your favorite recipes and videos anywhere in the world. Whether it’s your family or friends, having people around with the same goals is always a good motivator. You can compare notes, swap recipes, and be each other’s rock when things get tough. The more you surround yourself with people who are on the same path, the easier it will be for you to stick to your plans. The trick here is to make sure the people you live with know your goal and respect it, whether that means joining you on your journey or simply removing junk food from the common areas. If you don’t have someone close to you who can act as a support, join a group. There are likely many people near you who want to eat healthier. If there isn’t a group, try forming one. Or if you don’t do well in those situations, there are also many websites and forums you can join to get advice and feedback. There will be times when your willpower crumbles or when you can’t avoid partaking in decadent food. But don’t beat yourself up over it. There’s nothing that demotivates people more than feeling guilt over a slipup. Rather than dwell on what you did, consider how you can do better for the future. And if it’s because you were celebrating a major event, focus on the happiness of the event rather than that cookie or bowl of ice cream you ate. Also, remember you don’t have to cut out all treats. It could even be beneficial to include some cheats in your nutrition plan. This way you don’t feel you’re sacrificing too much, and you can plan these days around upcoming events such as birthdays, holidays and other celebrations. 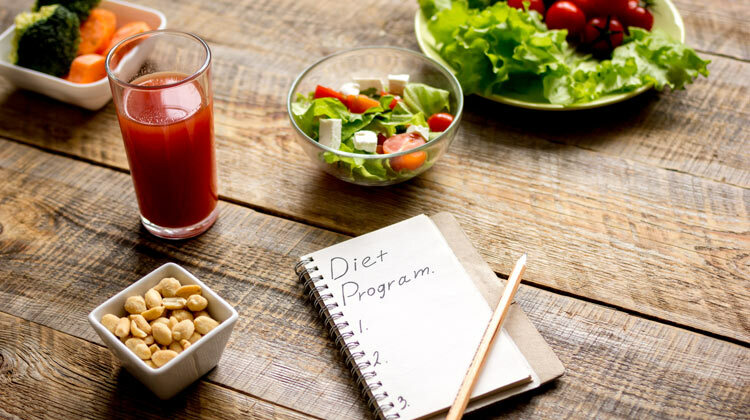 Sticking to your nutrition plan can be difficult, but if you take it slow, understand your personality and time limitations, you should be able to transition smoothly into a more healthful lifestyle. How do you stay on track with your nutrition plan? Let us know in the comments below. About the Author: Cassie is a freelance tech writer. When she’s not tapping away at the computer, she enjoys whipping up healthy homemade meals for her family. She loves how technology has made it even easier to lead a healthy lifestyle wherever she is. Meal planning makes a big difference in sticking to a healthy diet. Thanks for creating this post. It is really helpful. Keep up the great work.